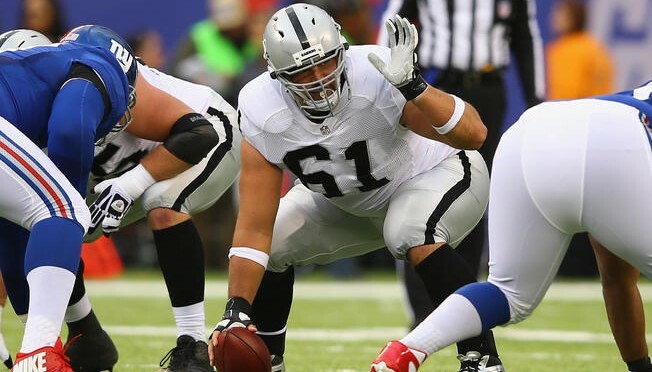 Stefen Wisniewski, a center who spent his first four NFL seasons with the Oakland Raiders, on Saturday signed as an unrestricted free agent with the Jaguars, the team announced. Terms and duration of the deal were not disclosed. “We had the opportunity to spend time with Stefen earlier this month and remained in contact with him with the hopes of getting a deal done,” Jaguars General Manager David Caldwell said in a statement. “We are excited to get him on board before we officially start our offseason conditioning program next week. Wisniewski, a second-round selection by the Raiders in the 2011 NFL Draft from Penn State University, started all four seasons with the Raiders, starting 16 games as a rookie and 16 games this past season. He started 15 games in 2012 and 14 in 2013. He also started 15 games at guard as a rookie. The Jaguars early in the unrestricted free agency period signed seven veterans, including right tackle Jermey Parnell from the Dallas Cowboys. Wisniewski reportedly also visited the New England Patriots, Washington Redskins, Seattle Seahawks and Tennessee Titans in free agency, and reportedly underwent surgery to repair a torn labrum earlier this offseason. Wisniewski played the past two seasons under Jaguars offensive coordinator Greg Olson, who held the same role with the Raiders the past two seasons. Wisniewski last season was part of an offensive line that allowed 28 sacks, the sixth-fewest in the NFL. In 2013, he started 14 games at center when the Raiders ranked 12th in the NFL in rushing (125.0) and sixth in yards per rush (4.6).